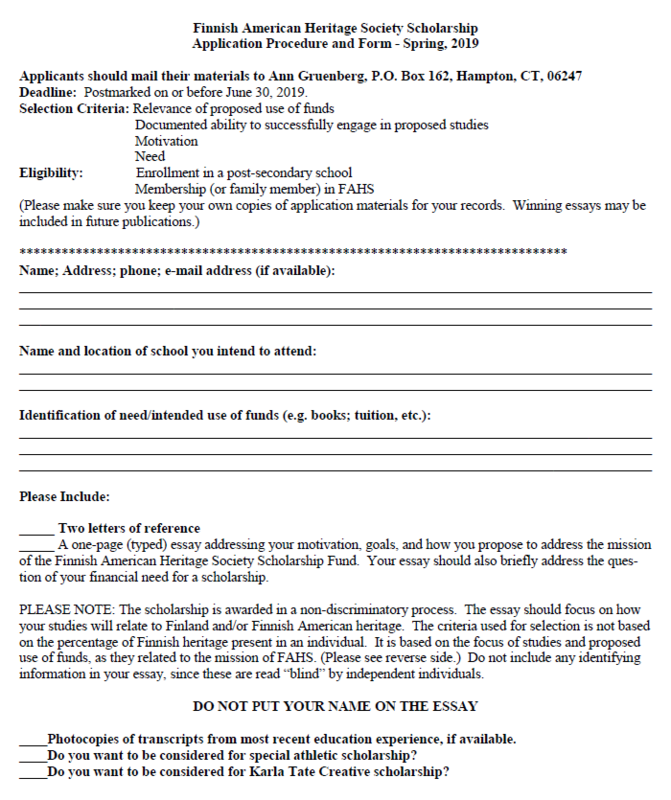 The Finnish American Heritage Society Scholarship Fund was started in November, 2000. Since then, we have awarded thirty-eight scholarships to students who are motivated to perpetuate the mission of FAHS. The pri-mary purpose of the Scholarship is to perpetuate Finnish-American heritage through support of relevant educa-tional initiatives. These can be related to, but not limited to, music, the arts, health, education, the environment, and architecture or engineering. The Scholarship Committee does not discriminate based on age, gender, ethnicity, nationality, belief, or any other conditions. Scholarships will continue to be awarded annually. We greatly appreciate ongoing donations to this important fund, to ensure it will continue “in perpetuity.” Our current endowment balance is over $20,000. The committee invites candidates to apply, with the deadline of June 30, 2019. The awards are pre-sented in the fall. Members and their families are eligible. Anyone who has been awarded a scholarship is asked to wait at least a year before re-applying, to give others a turn. We now have three awards: The General Scholarship, the Korsu Athletic Scholarship, and the Karla Tate Creative Scholarship. The procedure for application is on this form. If you have questions, please call Ann Gruenberg, Chair, Scholarship Committee at 860-455-1211.